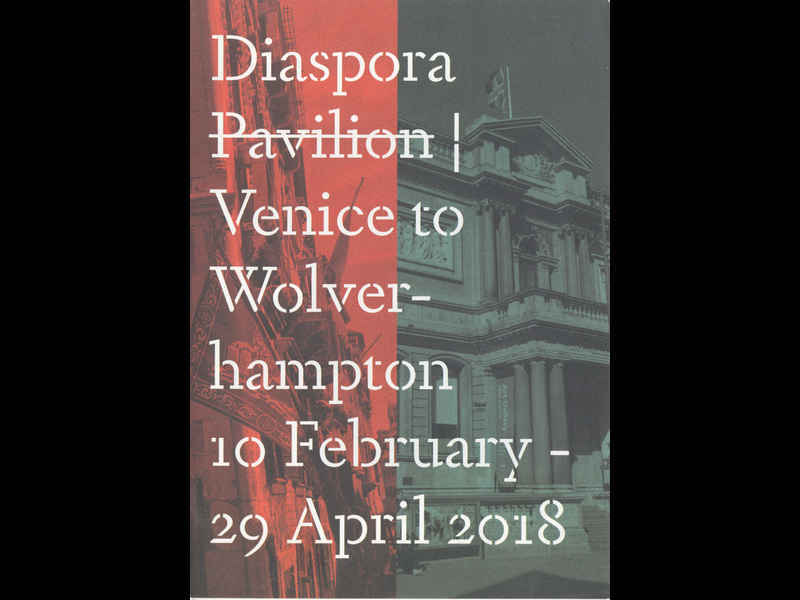 Brochure for Diaspora Pavilion | Venice to Wolverhampton, “a re-staging of a selection of works previously shown in the exhibition Diaspora Pavilion that took place in Venice during the the 57th Venice Biennale last year. The works shown here are by seven of the 19 artists who were part of the Venice show, all of who were selected due to the variety of ways that their practices engage with diaspora as a concept. On the ground floor Larry Achiampong is screening a short film entitled Sunday’s Best in the Contemporary Gallery. The film addresses the impact that colonial histories have had on religious practices within the African diaspora. In the West Gallery susan pui san lok has installed a new configuration of an on-going work entitled Golden. Composed of shimmering gold curtains accompanied by audio pieces, plus a video work not previously exhibited in Venice, this installation explores notions of nostalgia and aspiration. Beginning in the Morris Gallery and continuing on the first floor, Abbas Zahedi presents a re-formulation of the site-specific installation he developed for the original Pavilion with the new addition of a video work. In his practice Zahedi explores survival techniques for what he has termed neo-diasporic predicament, one of which is the exercise of bottling drinks, which the artist himself performs. Zahedi has produced a Saffrock Shandy for Diaspora Pavilion, which will be sold in the café upstairs. On the first floor of the Gallery five paintings by Kimathi Donkor have been inserted into the displays in the Victorian and Georgian galleries. These interventions address and disrupt different historical moments, invoking figures and myths across time periods, to generate new perspectives in painting. In the Focus Gallery Paul Maheke presents The River Asked for a Kiss (To Pateh Sabally), a series of four hanging curtains on printed text, and In the Watery Core of those Stories, which includes two fish tanks placed on the floor. Both works explicitly reference the Venetian canal, echoing Maheke’s interest in water as a subject through which to explore issues around migration and displacement. For the Diaspora Pavilion Michael Forbes has produced a new series of sculptures and paintings exhibited here for the first time. These works, like the series shown in Venice, bring together historical artefacts and contemporary objects as a means of commenting on processes of valuation and collecting in connection to urgent issues of the moment. In an adjoining gallery Erika Tan has re-designed the large-scale work made for the Venice Pavilion, The ‘Forgotten’ Weaver (RETURNS), onto which she projects two video pieces, and has introduced a third projection element, The Weavers Lament. Together the four elements of the installation consider the relevance in the postcolonial reframing of modernism. The brichure folded out to reveal Grounf floor and First floor plan of the exhibition, together with reproductions of each of the artist’s work, plus Artist biographies. 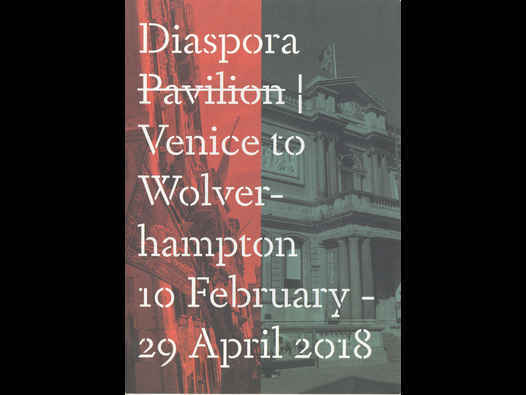 The back of the brochure contained contact details for Wolverhampton Art Gallery, plus some information about International Curators Forum, which was responsoble for Diaspora Pavilion | Venice to Wolverhampton.